Doctors from the Army Medical Corps of the Pakistan Army were called on Saturday to hospitals in Punjab, the largest Pakistani province where doctors have been on strike for about two weeks crippling hospital operations. The Punjab government has lately requested the Pakistan Army for doctors so that they can take over the duties of the striking doctors who are demanding a raise in their salaries and perks. 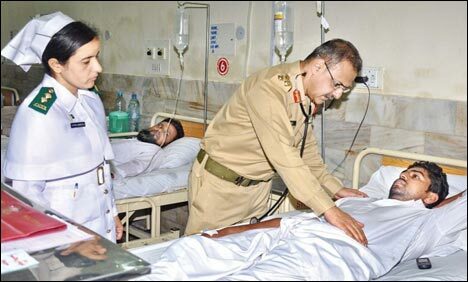 Inter Services Public Relations (ISPR) said that upon the request of the Punjab government some 150 doctors have been assigned duties at the government hospitals in the province so that the patients could be attended to. The doctors from the medical corps, both male and female, of the army will perform their duties in army uniform. However, the doctors will assist the core medical operations and will not assist in management and other administrative affairs. The two-week-long strike of the Young Doctors Association at public hospitals has almost shut the outpatient departments of all the hospitals. The poor patients in the province are the ones who are suffering. The strike has been causing immense hardship to patients and their attendants who visit the government hospitals in the thousands on a daily basis across the province. The young doctors’ boycott of duties at outdoor wards is a part of their pressure tactics to force the government to accept their demands, So far, the Punjab government has not given in. However, with the arrival of the doctors from the army, the situation may not improve because some 6,000 young doctors are on strike and the available number of doctors is far below this. This entry was posted in News and tagged AMC, Army Medical Corps, ISPR, Pak Army, Pak army doctors, Pakistan Army. Bookmark the permalink. Army medical corps is facing a serious manpower crunch as hardly anyone applies to join army after doing mbbs from civil. Also, while the TO&E is much lower then the manifold increase in entitlement and workload, most hospitals are working on 1/2 or even 1/3rd of authorised strength. All doctors in military hospitals are severely over worked. A lot are on field duty, where although there is little to do, the doctor is not where hundreds are lined up. So its not a wise decision to jump in to help Punjab Govt. The Federal Govt should sent docs from thier hospitals or ad hoc docs should be employed. Sending uniformed docs is a security risk in a country where uniformed peope are forbidden to move out of cantt in uniform. Army should ask why doctors are not joining and why so many are applying for release.